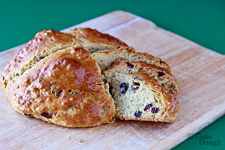 Irish Soda Bread is an easy recipe to make for St. Patrick’s Day. I don't care for corned beef and cabbage or green beer, so enjoying Irish Soda Bread is my favorite way to celebrate St. Patrick's Day. As the name implies, soda bread uses baking soda as the leavening agent. Traditionally a cross is cut into the top of the bread before baking. Legend has it that a cross was cut into the bread to ward off the devil or to let the devil out of the bread. It actually aids in baking by allowing the bread to expand so the heat can reach the center. The cross also makes it easy to break the bread into portions and reminds us to give thanks. An easy Irish Soda Bread recipe. 1. Preheat oven to 375°F and grease baking sheet.2. Combine flour, brown sugar, baking powder, baking soda, and salt.3. Using a pastry blender, cut in butter until crumbly.4. Whisk 1 egg and buttermilk in a small bowl; stir into dry ingredients just until moistened then fold in raisins.5. Add additional flour if dough is too sticky and knead dough on a floured surface for 1 minute; shape into a round loaf.6. Place loaf onto greased baking sheet and cut a 1/4 inch deep cross in the top of the loaf.7. Beat the remaining egg and brush over loaf.8. Bake loaf for 30 - 35 minutes in 375°F oven.9. Cool before cutting and serving. Fantastic color on that crust, I can smell it from here :) Slathered in butter for me..
Looks great! I love soda bread... I have never added raisins in mine, but I love the idea :) Thanks for sharing! Loving all these Irish Soda bread recipes...I've never made it but it is obvious that I need to. It looks wonderful Jill! Lovely golden color. Seems delicious! This is such a great and simple bread to bake. I'd almost forgot about it. I have all the ingredients on hand except for the buttermilk. I've never made it with raisins but it sounds delish! Thanks for sharing! This is on my list for St. Patties day too, although mine lacks raisins. Perhaps I need to remedy that mistake! Great St. Pat's contribution! Though I've made many yeast breads in my day, I'm a real fan of quick breads, and especially one like this because it's one simple loaf! Looks delicious! I've seen so much soda bread that I'm starting to get a really strong craving for. Yours looks amazing! Thanks for sharing. I really need to eat some of this NOW! The whole blogosphere is full of soda bread. If you had been my neighbor, I would have been over before I could finish this comment. I did not do St Pat's this year as I was visiting a friend in Florida. 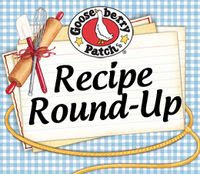 I will keep this recipe and will try it on my Irish husband. I just made this and it was EXCELLENT! I love the little bits of raisins inside! Yum!